I started Christmas! I couldn't help it! I've been listening to Christmas music for two weeks, the lights are up on our house and the only reason we don't have our tree yet is because we always go cut our own and it's still a bit early for that. Plus, my husband insists he wants snow for our tree hunt adventure. While I like to keep our Christmas décor fairly traditional (red, gold, critters and wooden ornaments), I couldn't help but come up with a mood board for something a little different. My love for rose gold isn't new, but I had never thought of incorporating it into a Christmas theme. 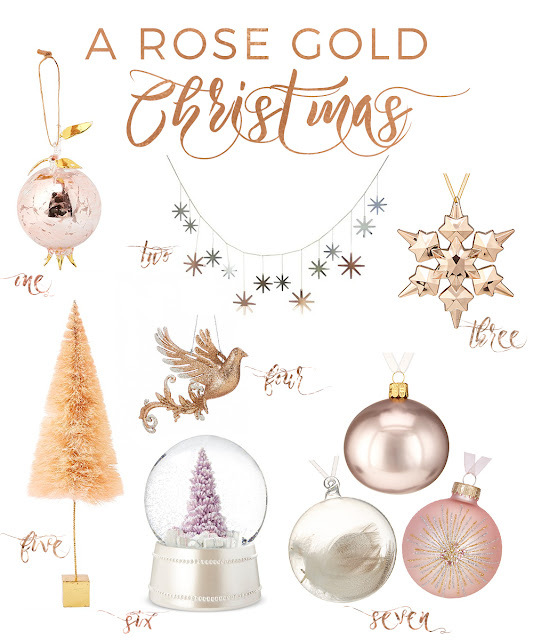 Here's my idea of a rose gold Christmas (I'm picturing those on a white tree... swoon!). How are you decorating for Christmas this year? Original or traditional?